Verso, in graphite pencil: "No. 12"
Moments after the apostles turned away the Canaanite woman, Christ listened to her demonstration of faith and healed her daughter of demonic possession. 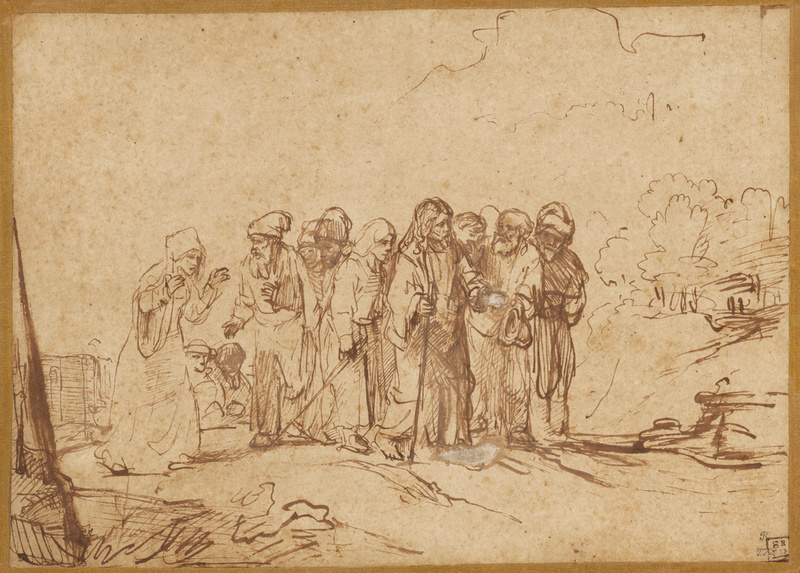 The two areas of focus in this drawing correspond to these two main characters, as yet separated--Christ in the center and the Canaanite woman in an exchange with an apostle at the left. The onlookers behind and beneath the woman and the indeterminate projection at the left add depth and foreground to the scene. Modeling his figures with fine hatching, Rembrandt Harmensz. van Rijn displayed a wide variety in the width and character of his lines. Correcting and altering the composition as he worked, he partially blotted out one of the onlookers' faces and covered Christ's left hand and foot with white bodycolor. The lightly sketched landscape at the right typifies Rembrandt's characteristic use of space and light, easily suggested with ink alone. In the 1640s, Rembrandt preferred to draw directly with pen and ink, unlike most of his contemporaries, who began their drawings with preliminary pencil or chalk sketches, then covered over those lines with ink. John B.S. Morritt, British, 1772 - 1843, by descent within the family.